383. Definition - importance. This term (from aestivus, of summer) refers to the arrangement of the floral envelops while yet in the bud. It is an important subject, since in general the same mode of aestivation regularly characterizes whole tribes or orders. It is to the flower-bud what vernation (vernus, spring) is to the leaf-bud. 384. The various modes of aestivation are best observed in sections of the bud made by cutting it through horizontally when just ready to open. From such sections our diagrams are copied. 385. Separately considered, we find each organ here folded in ways similar to those of the leaf-bud; that is, the sepal or the petal may be convolute, involute, revolute., etc, terms already defined. 386. 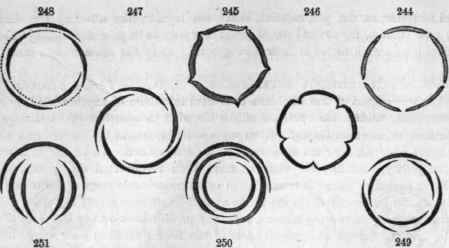 Collectively considered, the aestivation of the flower occurs in four general modes with their variations; the valvate, the contorted, imbricate, and plicate. 244-251, Modes of aestivation. 250, Petals of the wall-flower. 392. The triquetrous, consisting of three leaves in each set, one of which is outside, one inside, and the third partly both, as in tulip, Erythronium, according to the one-third plan in phyllotaxy. 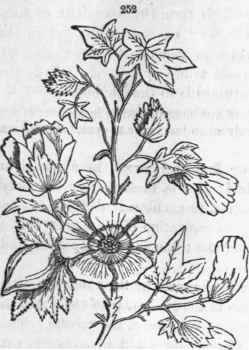 252, Gossypium herbaceum, the cotton plant. Petals contorted. 393. Convolute, when each leaf wholly involves all that are within it, as do the petals of Magnolia; and vexillary, when one piece larger than the rest is folded over them, as in the pea (251). 394. Plicate or folded aestivation occurs in tubular or monopetalous flowers, and has many varieties, of which the most remarkable is the supervolute, where the projecting folds all turn obliquely in the same direction, as in morning-glory, thorn-apple (Datura). Diagrams of flowers (as seen by cross-sections). 253, .Jeffersonia diphylla: o, ovary; 8, stamens; d, inner row of petals, aestivation triquetrous; b, outer row of petals, aestivation contorted; c, sepals, aestivation quincnncial. 254, Lily. 255, Strawberry. 256, Mustard. The pupil will designate the modes of aestivation. The aestivation of the sepals often differs from that of the petals in the same flower. Thus, in the pink the sepals are imbricated and the petals contorted. 395. The position on the parts of the flower, with respect to the main axis and the bract whence it arises, is often important in description. That part which is adjacent to the axis is the posterior or upper, while that which looks toward the bract is the anterior or lower part.